Once again this year, Alexandra Drane of Eliza Corp., and friends, have coordinated the Engage With Grace blog rally, in which scores of healthcare bloggers devote their site, for a day or more, to this important topic. They chose this time of family get-togethers to encourage conversations about our end of life choices. It may seem odd, but what other opportunities do we have to discuss, in quiet moments, this most intimate of subjects? In case you haven’t seen it, here’s Alex’s talk at TEDMED 2010 in San Diego, with the moving story of her sister-in-law’s death – and how very, very important it was to her daughter (to this day) that her mother’s wishes were honored. Be sure your wishes are known. Even if you don’t expect your words to matter for a long, long time, say them now. Here’s “The One Slide” with the five questions Engage With Grace asks us to answer. In fact, you can go to their site and register your wishes. We find other people captivating as well. In fact, there’s a meme going around on facebook where people share a handful of things that most people don’t know about them – and there’s a great joy in learning these tidbits about the friends and family we think we know so well. This Thanksgiving, we’re asking our friends and family to try this exercise, but with a twist – we want to know how they’d answer just five questions on their end-of-life preferences. What? Are you CRAZY? Talk about how you’d want to die over Thanksgiving? Yup – that’s exactly what we’re suggesting. You know why? Because this is a conversation you absolutely want to have exactly when you DON’T need to have it… and it’s a conversation you need to have with your loved ones. Our hope for you this Thanksgiving is that you’ll have the luxury of checking both those boxes. As humans, we’re all pretty fascinating, and exploring what matters to each of us under different circumstances can be a captivating conversation…and captivating conversations are part of what turkey dinners are all about. It’s also a vital one – there will be few times in our lives where ‘getting it right’ is more important than at the end of them. There are also few greater gifts you can give to your loved ones, and they to you, than making sure these lives we are living with such ferocious intent have the luxury of ending the same way. Engage with Grace is a way to help get the conversation about end of life started – a way to Engage in this topic with Grace. 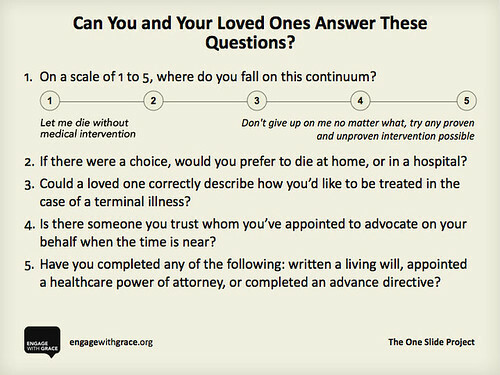 Just five simple questions about our end of life preferences that we can all commit to being able to answer – for ourselves, for our loved ones. Take a quick look – do you know how you would answer? Could you answer for your loved ones? There is no wrong answer – It’s only wrong if you don’t know your answers … or if you haven’t shared them. Coming together over the dinner table to talk about the important stuff is part of our DNA…and it’s where so much of the good stuff happens. We connect, we share, we learn, we laugh, we fall in love, out of love, we fight and make up, we celebrate, we (maybe even) cry. If this Thanksgiving turns out not to be your thing, then pick another dinner. Check out the genius Death over Dinner movement started by our dear friend Michael Hebb to help make that happen. Thousands of dinners happening across the country – from cool hipsters to the very dearest grandparents coming together to think hard, eat well, and make sure we nail this end of life thing by making sure we’re talking about it. We double dog dare you to have a Death Dinner – and not enjoy it. Know what else? What we want at the end of our lives often changes as we go through them… a mum of toddlers may find she’d opt for more intensive treatment options, while a great-grandfather may feel more comfortable choosing quality of life related treatment… so have this conversation once, then keep having it. None of us are planning for anything less than living forever – so until one of us is smart enough to make that happen (go Google!) – let’s at least commit to this: we live our life with intent – we can end our life with that same honor. 70% of us want to die at home, only 30% of us do. Each of us will only die once – make sure you get to die the way you want. Then make sure that’s a gift you give to your loved ones as well. Just five questions. Just get started. Could there be a more important conversation to have this Thanksgiving? Nope. Maybe that’s why they call it talkin’ turkey.